Moving time: 6 hr 13 min. Wind: slight tailwind during last 5 miles or so. Otherwise light, variable breezes. It was nice to stay in a hotel room last night. I sure needed the break. I had a chance to dry my tent, ground cloth and sleeping bag by hanging it up in the room. The air conditioning and television were also a nice luxury. My average ride distance has increased to 60.5 miles per day. 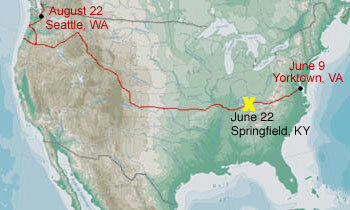 In order to go all the way to Vancouver, BC and back down to Seattle I need to do 62 miles per day. Getting used to riding every day, riding the Appalachians and the bum Achilles Tendon have left me a little short on my mileage. If everything goes well and the weather is good I should be able to complete my goal. I got a 7:00am start today after a free continental breakfast at the hotel and made pretty good time to the ending spot. It was the easiest 4000 feet of climbing I have ever done since the roads are mostly low, rolling hills. Usually I dropped 75 feet to gain it back again immediately. A good roll down the hill provides enough energy to get back to the top. There were only a few longer hills at the beginning and end of the segment. I passed by horse and cattle farms as well as many hay fields that were being cut and baled. They haven't had rain here for about a week and don't look forward to any soon. I could use some clouds! 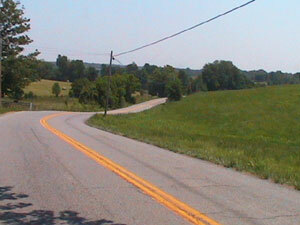 It surely was a pleasant day of riding through these rolling hills. I don't miss the Eastern Kentucky and Virginia mountains at all! Everyone waves here in Kentucky. It is almost a safety hazard having to remove my hand from the handlebar to wave back but I do it anyway. I'm getting tired of waving but it's so hard not to be nice. They are acknowledging what I'm doing so I should show everyone courtesy I suppose. They rumble strip every road here. It doesn't matter how wide, narrow, winding or straight the road is. They put rumble strips everywhere! They should change their motto from "The Bluegrass State" to "Come to Kentucky and drink and drive - our rumble strips will keep you on the road." 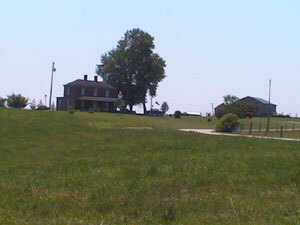 Lincoln Homestead State Park preserves the pioneer heritage of President Abraham Lincoln's parents, Thomas Lincoln and Nancy Hanks. Within the park grounds are a reproduction of the cabin that was the boyhood home of Lincoln's father, and the actual house in which the President's mother lived during her courtship with Thomas Lincoln. 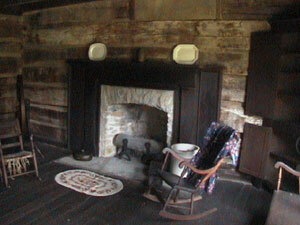 Split rail fences and pioneer furniture made by Thomas Lincoln and his contemporaries complete the life in the rugged Lincoln era. It seems that the Lincolns lived throughout the country. Abraham Lincoln was born here in Kentucky (near where I'll camp tomorrow night) but lived in Illinois for a greater chunk of his life. This way Illinois calls itself the "Land of Lincoln." The Lincolns did not come out of poverty like most history books would like one to believe. They were at worst an average pioneer family on a new farm. Hardin County records show that Thomas Lincoln, Abe's father, stood 16th in property value among the 98 persons listed on the tax rolls. In 1815, only six of 104 taxpayers owned as many horses as the Lincolns. 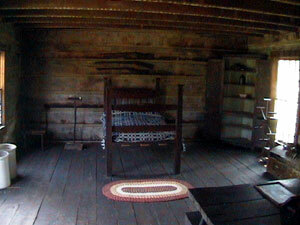 Here are some pictures from inside the cabin. 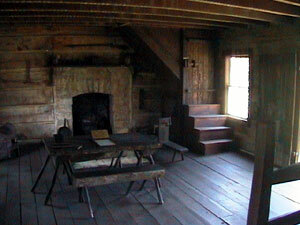 The last picture shows the fireplace where Thomas Lincoln proposed to his wife, Nancy Hanks. I'm looking forward to a good night's rest and an early start in the morning to make for a short day of riding.